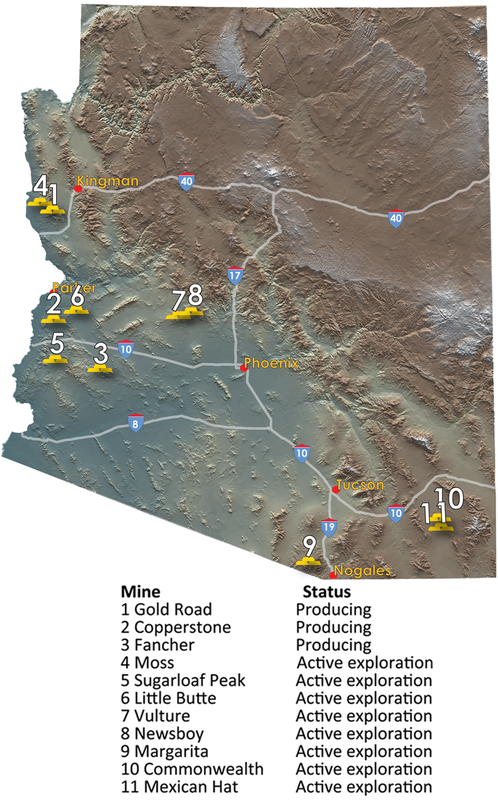 The decade-long rise in the price of gold from less than $400 per troy ounce to over $1,600 has resulted in the renewal of gold mining and increased exploration activity in Arizona. Lode properties are receiving the most significant activity due to their large number of contained ounces of gold. A few, small placer properties are also being sampled or operated on a limited scale. Three underground mines are currently active. Mojave Desert Minerals, LLC was the first to resume production in September 2010. The private company operates the Gold Road mine and accompanying cyanide mill at Oatman. The mine is located in western Mohave County in the Oatman Metallic Mineral district, the state’s largest primary gold district based on production. A Tertiary age, epithermal quartz vein supplies ore from the 600 to 900 feet-deep levels of the mine. At Copperstone, located about 15 miles north of Quartzsite, American Bonanza completed construction of a 400-ton per day gravity and flotation recovery plant. 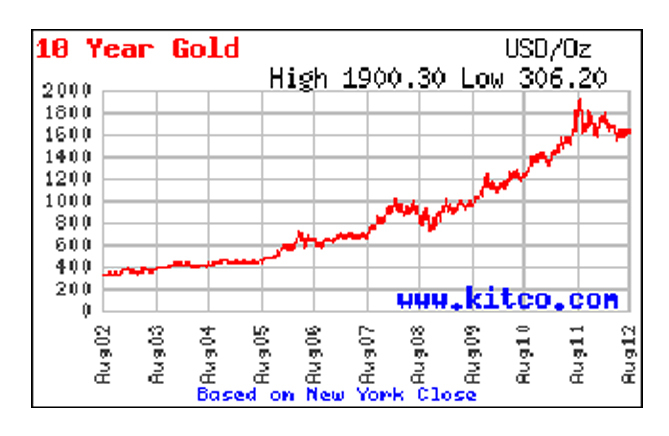 In March 2012, the company announced their first shipment that contained over 700 ounces of gold. Underground development work on the detachment-fault-associated deposit is approaching ore production levels to match the mill’s capacity. Luxcor Gold began underground development of the Fancher deposit this year. It’s a recently discovered deposit hosted in mid-Tertiary volcanics located adjacent to the past producing Bronco Verdstone Oakland property in the Little Horn Mountains of western Arizona. Luxcor is considering either shipping material as precious-metal-bearing siliceous flux to copper smelters in central Arizona or building a gravity mill near Salome. A number of lode gold properties, most with previously identified resources, are receiving significant exploration. The following is a brief review of those activities covering the projects from the northwest to southeast. Northern Vertex Mining Corp. acquired a 70% interest in the Moss mine from Patriot Gold Corp in March 2011. 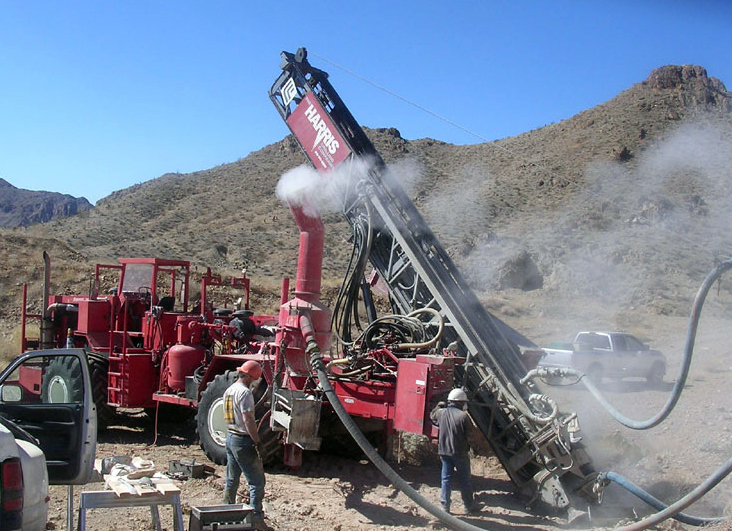 Since the acquisition Northern Vertex has completed a 27,000-foot drill program on a stockwork system located in the Oatman metallic mineral district. The targeted zone is 45 feet wide and has been traced along a strike length for 5,000 feet. A recently completed NI 43-101 report on the deposit announced a gold-silver indicated and inferred resource of 590,000 gold equivalent troy ounces. This is the largest known NI43-101 compliant resource in Arizona. Additional drilling is planned for a northwest extension of the deposit. An April news release reported a drill hole in that area included a 50.29 meter mineralized intersection that included 20 meters of 1.67 grams of gold per ton (0.054 ounces per ton). At Sugar Loaf Peak, located southwest of Quartzsite in La Paz County, Riverside Resources Inc. and its former partner, Choice Gold Corp. have expended two million dollars on geophysics, geologic analysis, and a 3,000-meter drill program. A gold surface anomaly covering over two square kilometers has been identified. Numerous drill intercepts of 0.4 gold grams per ton (0.013 troy ounces per ton ) or better have been reported from the drilling. Altered felsic volcanics host mineralization that is interpreted as related laterally to, or overling, a porphyry copper system. Tuffnell Ltd. completed a 16-hole drilling program in 2011 at the Little Butte mine in the Plomosa Mountains. Gold assay results from the 5,395-foot drill program were announced in April and the company plans multi-element analysis of the pulps to aid target delineation. In 2011 Vulture Peak Gold LP executed a purchase agreement for the famous Vulture mine south of Wickenburg with the shareholders of V.M. P. Inc. Drilling this year has been directed to expand a previously identified open-pit-mineable portion of the deposit. The Vulture mine, which has produced 340,000 ounces of gold over its long history, has a non-NI 43-101 compliant gold resource of 328,000 ounces. 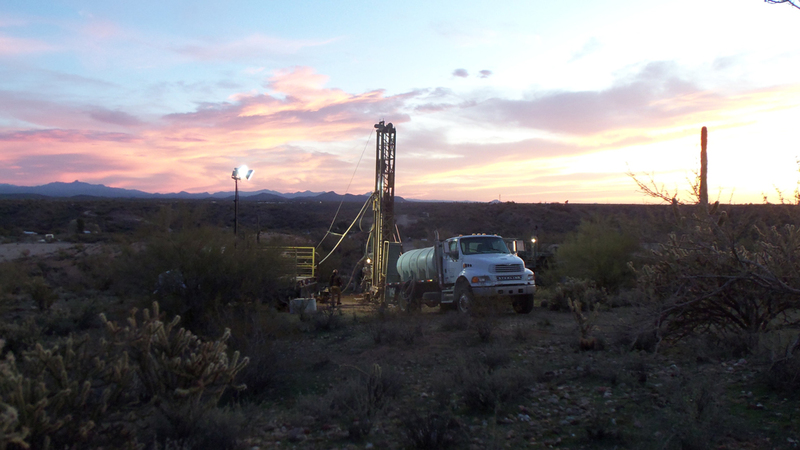 Bullfrog Gold Corp. holds a large land position covering the Newsboy project located southeast of Wickenburg. Previous exploration work consisting of 152 holes drilled from 1987 through 1992 identified 5.4 million tons with average grades of 0.044 gold troy ounces per ton and 0.64 silver troy ounces per ton. Mineralization is in a near surface breccia zone associated with a detachment fault. Tertiary volcanics contain 80% of the historic resource with the remainder occurring in Precambrian schist. The company plans to drill additional exploration targets, conduct a preliminary feasibility study for an open pit mine, and gather metallurgical and environmental data this year. Hellix Ventures Inc. acquired the Margarita mine in western Santa Cruz County in 2010. Previous exploration had identified a resource of 30,000 troy ounces of gold. The mineralization occurs in flat-lying silicified or sericite-clay zones along steeply dipping faults in the Cobre Ridge volcanic rocks of Jurassic age that have been intruded by Tertiary quartz monzonite. Gold occurs along a strike length of over 4,000 feet and is distributed over an altered zone that is 1500 feet wide. After completing geologic work in 2011 the company conducted 1,023 feet of diamond drilling in early 2012 to assess near surface gold mineralization. The company has filed applications to drill thirty-nine additional shallow holes. These will infill and expand the main Margarita zone, and test the North Hill and Cascabel Zones. Commonwealth Silver and Gold Mining Inc. announced results in June from a 35-hole diamond drill project at the Commonwealth silver gold deposit at Pearce in Cochise County. The drilling tested veins and stockworks hosted in Tertiary and Cretaceous volcanics and sediments along 800 meters of strike length to a depth of 200 meters. Grades reported generally exceeded those of the current NI 43-101 compliant resources estimate. Drilling during the 1970s and into the mid-1990s totaled over 15,000 feet and work had reached a pre-feasibility stage for an open pit heap leach operation prior to the fall in silver and gold prices. Prior to 1942 high [A1] grade veins were mined, resulting in the production of 21 million ounces of silver and 138,000 ounces of gold. That made the Commonwealth one of the largest primary silver mines in the state. In March Auracle Resources, Ltd. announced assays from its 19 hole diamond drill hole program at Mexican Hat, 7 miles south of Pearce. The work was intended to test the area defined by Placer Dome and also investigate extensions to the south and east. A Tertiary volcanic assemblage of four units hosts a low-sulphidation epithermal gold occurrence that appears to favor deposition in structurally prepared fault-fracture (joint) zones. The historic resource reported was 360,000 troy ounces of gold at an average grade of 1.2 grams per ton (0.039 troy ounces per ton). Drill conditions were reported as difficult and recoveries as challenging. Assay results from the diamond drilling as compared to historical reverse circulation drilling were lower in most areas. Consequently a future reverse circulation drill program is planned. [A1] Prior to 1942, mining of high grade veins produced 21 million ounces of silver and 138,000 ounces of gold, making the Commonwealth one of the largest primary silver mines in the state.